MightyRecruiter helps recruiters and hiring managers of companies of all sizes find more quality candidates, faster. Free-to-use, Unlimited Jobs and Unlimited Users. MightyRecruiter is a cutting edge, intuitive recruiting solution that helps you recruit better. Post to job boards, source passive candidates, manage applicants and hire the most relevant candidates to your jobs at no cost to you. Mighty Recruiter Reviews Recently Reviewed! "I am a MightyRecruiter customer and received an Amazon gift card for completing this review." Pros: Mighty Recruiter's one-stop solution provides everything hiring managers need to attract, match, hire and manage the most suitable candidates. The ability to match candidates with a resume database consisting of around 20 million profiles and post on 29 free and paid job boards make Mighty Recruiter one of the most powerful solutions. MR also helps recruiters in making their job postings more interesting and unique while ensuring that candidates understand what is expected from them. The jobs can even be posted on the social networks for maximum coverage. Software's intelligent analysis system matches candidates with the job descriptions and ranks them by their relevance, freeing recruiters from reading hundreds of resumes. 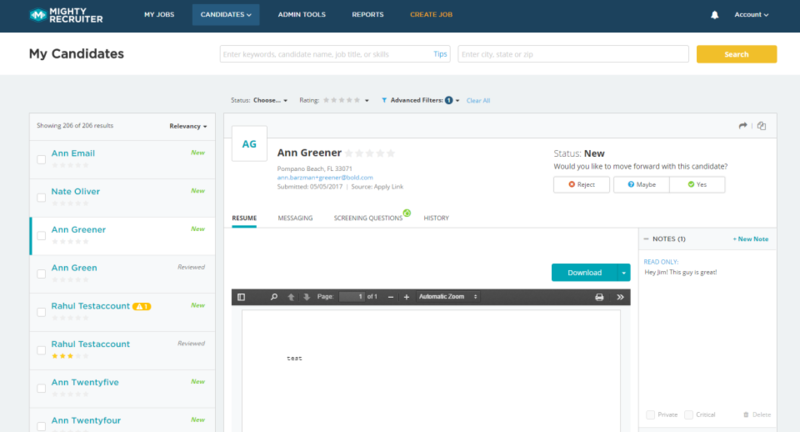 The system then automatically highlights the most suitable candidates for review. MR helps in getting in touch with highly ranked candidates and effectively managing the entire interviewing process. It sends/receives status-update messages automatically and makes it possible to quickly and effortlessly hire the ideal candidates. Cons: It is important to note that almost no service in the HR Software category is a perfect solution that can fulfill all the goals of various company types, sizes and industries. It may be a good idea to read a few Mighty Recruiter reviews first as certain solutions may dominate just in a very narrow set of applications or be prepared with a very specific type of industry in mind. Others can work with an intention of being simple and intuitive and consequently lack complicated elements desired by more experienced users. You can also find solutions that cater to a broad group of users and offer a complex feature toolbox, however this usually comes at a more significant cost of such a service. Make sure you're aware of your requirements so that you select a service that provides all the functionalities you search for. Comments: We have been using MightyRecruiter for a few months now and have had successful hires. Our rep that we work with is AMAZING and he was from the get-go and still continues to provide high customer service. He is very responsive and helpful when we have questions or if something goes wrong. We have had a few glitches using MightyRecruiter but nothing that our Rep didn't fix within a reasonable time. We choose to use our own ATS system using our own custom URL and that has its ups and downs. For instance, on one particular job board, they don't allow companies to use their own ATS link in the job posting thus resulting in it not getting posted on that job board. It's not a huge deal, just good to know that info and our Rep has no issues being upfront and honest with us. I consider this company trustworthy, very responsive to their customers and a great way to keep organized in the recruiting world. This is an honest review based on my experience with MightyRecruiter and I have to disclose the following: "I am a MightyRecruiter customer and received an Amazon gift card for completing this review." In no way does the gift card alter my review, it's just an incentive for writing my opinion and just another reason why MightyRecruiter is a great company, they not only offer Recruiting help but they go above and beyond for their customers with a simple reward for an honest review. Pros: Keeps everything in one system. Excellent Customer Service, very responsive. Very easy to use and affordable too. Cons: When posting to certain job boards, due to the way the contract is set up with MightyRecruiter and the Job Board Site, there could be issues. Excellent Customer Service with Timely response and attention to detail. Pros: I worked with the representative. He was very proactive and helpful. Their free trial is truly free. Their questionnaire eliminated resumes that didn't apply to my jobs. The questionnaire doesn't have to be mandatory so that you can still review applicants that didn't take the survey. I also like the fact that they include a radius for your job posting. This eliminates someone from applying for another zip code or time zone for that matter. I look forward to working with Josh in the future and found the experience as a whole to be excellent. Cons: It took a little while to generate leads, but then again they didn't throw random resumes at me either. Overall: I worked with the representative. He was very proactive and helpful. Their free trial is truly free. Their questionnaire eliminated resumes that didn't apply to my jobs. The questionnaire doesn't have to be mandatory, so that you can still review applicants that didn't take the survey. I also like the fact that they include a radius for your job posting. This eliminates someone from applying from another zip code or time zone for that matter. I look forward to working with rep in the future and found the experience as a whole to be excellent. Thanks for taking the time to share about your recent experience with out service! We take your feedback seriously, in fact, we rely on it constantly to improve our customer's experience. Pros: The system is very easy to use, easy set up and training, great customer support which is fast to respond to questions etc. Probably the best cost effective way to get your jobs posted across multiple platforms. Cons: Not the most time responsive when trying to post jobs that are needed to be filled fast there is a 24 hour + time lag but besides that everything works. Pros: Mighty is one of those job boards that is great if you are looking for skilled workers. Their database houses the most number of skilled workers. The job board is easy to use. It does still use the classic Boolean logic in running searches. What makes this job board stand out is that it has a rating feature that is a bit unique to them. Cons: I do wish that the job boards caters to every other type of job. 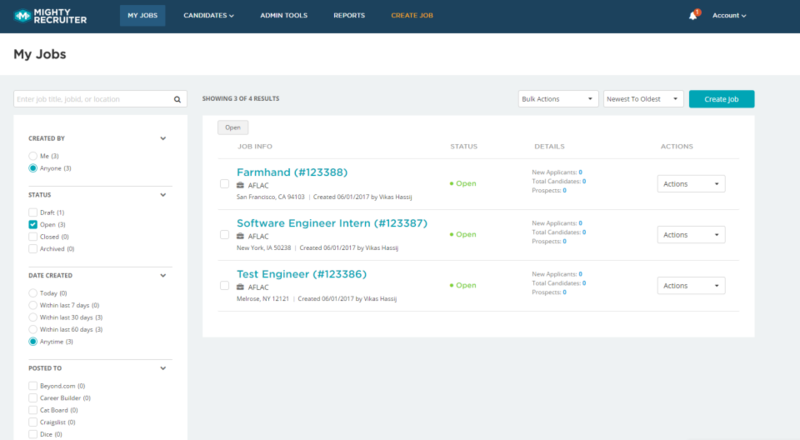 Pros: This is a great all-in-one software for managing open job requisitions and managing applicants. 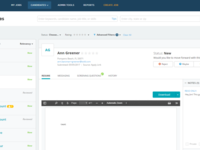 A simple interface makes it very user-friendly for recruiters and HR professionals. 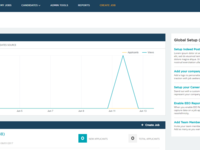 Dashboard offers reports and graphs to track performance. Cons: Free version is extemely limited. It only allows you to post one job opening, which cannot be posted on any of the job baords. Therefore, there is no way to attract candidates to your company page or any other positons. Must have a premium subscription to access this software's full capacity. Desktop version can be slow when uploading resumes and formatting job descriptions. Thank you for your feedback, Seán! MightyRecruiter is a free applicant tracking system, with the ability to post jobs for free at no cost - including destinations like ZipRecruiter, JobsInventory.com, Juju Jobs, Glassdoor, and more! There are paid services or options of course, but these are not entirely necessary to attract and select candidates. Feel free to reach out to us @ recruiterhelp@mightyrecruiter.com or by calling (844) 382-1750 so we may have a chat. You can perform most tasks quickly. There are added features that most resume/candidate sites do not offer. Cons: Not producing the best candidates selection. Overall: I really love Mighty Recruiter (formerly JobTab) however, we just do not get the best candidates from either the resume search or from our job postings. We recruit specifically within the Logistics & Supply Chain field so that may be what is affecting our results. Overall we really love the Mighty Recruiter team and think that they are making huge strides to give their customers a top quality product. Thank you for your review! 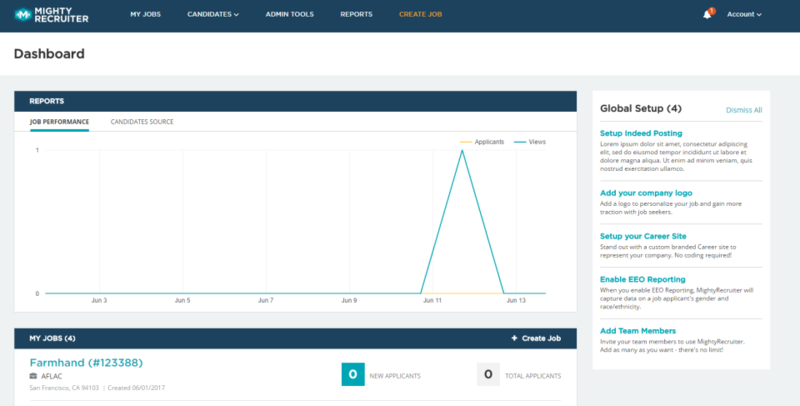 MightyRecruiter is a free applicant tracking system! With free job postings going out to a list of partners including ZipRecruiter, Glassdoor, and LinkedIn! Please let us know if you have any questions or need anything moving forward. We look forward to hearing from you! Pros: Mighty has the unique features of free job posting & that will be published to many job boards and other social media platform. As a user, I'm been receiving quality applications for my niche positions as well. The AI will give a rating to the candidates according to the job spec and resume match that is a wow feature to sort candidate easily. Cons: Certain jobs are not receiving many applications compared to other jobs posted hope this will be addressed soon. Overall: Your hiring needs will become fast if the jobs are posited in Mighty. don't perform too well amongst free job postings, which is why we have separate niche boards for similar jobs. Pros: I like the fact that this is a central location for all things related to finding your candidates. Traditionally this process has been very fragmented for us we had several job boards open in one tab and communicated to candidates through our email account and independently reviewed resumes that came in. It was a mess when we had several positions to fill. MightyRecruiter takes care of all this! I am a MightyRecruiter customer and received an Amazon gift card for completing this review. Mighty Recruiter Delivers Leads for Open Positions really Quick! Pros: MightyRecruiter gives leads in no time after posting a job. As a starter I'm using the free version and it exemplifies quality service, customer support is amazing, this saves us the trouble of looking for qualifying leads and the time to Screen applications. I am a MightyRecruiter customer and received an Amazon gift card for completing this review. Cons: MightyRecruiter is a platform and you need to be as detailed and clear on your job posting to get the targeted leads. Every step of the way, thier customer support reminds you on this. So be extra attentive on your messaging and define each job role and Qualifications carefully. 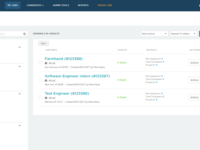 Overall: Quality leads for job postings, easy to organize screening and scheduling activities. Thanks for taking the time to review our product and service! Let MightyRecruiter lead the way to better applicants, and a better hiring process overall! Overall: I switched to MightyRecruiter when I wanted to upgrade from ZipRecruiter. I was excited at the possibility of not having to post roles to Indeed, Zip, and other job boards all on my own and having a system that did it all for me. However, I have found that I do not get as many applicants through Mighty as I did when I posted them all on my own. The interface of Mighty is a bit clunky. The way you have to go through new applicants is not efficient, and I don't like that the status doesn't automatically update (i.e. if I email a candidate, it doesn't automatically classify the candidate as "Contacted"). However, I do like its invite to apply feature and that is allegedly has millions of resumes to look through. I probably need to use that more to get the value of $280/month out of it. Thanks for your review, Christy! You should definitely try searching the Resume Database of 18+ million resumes - other customers have found this to be a great source of quality candidates. Comments: I think the cost is reasonable, labor aggregation seems competitive and access to external jobs is also a good feature. Pros: We were surprised at how easy it was to sign our company up for this site. What originally attracted us to it was that it was advertised as being completely "free". After utilizing some its contemporary recruiting software competitors, we are now aware of why that is. But, you can't beat paying nothing over something! This is elevated from a 6/10 to a solid 8/10 for beating out its contemporaries in affordability. Cons: The website interface is not as convenient as some other companies we have used and the features leave a lot to desired. Even though their "applicant database" is hefty, I still felt like I could have gotten better, more qualified results from another company if I shelled out a few bucks a month. It is highly affordable for a small business, easy to use, and the customer service is excellent! Pros: You will have everything at one place. It is amazing product to stay organized. You don't need to maintain multiple systems. Cons: I don't think there is anything solid to complaint about as of now. I am happy with what I have right now. Pros: Mightyrecruiter give you the opportunity to looking for the job of your dreams, basing in your profile qualifications and academic grade, they search for you job opportunities and give to change to select one of them that perfect fixed in your profile and location. Cons: Maybe the only negative issue is the distance and the limited options of get jobs os people who live outside the US and have to process their Job Permission, and that can limited their job opportunities. Overall: The capacity to offer a job based in your capabilities and your professional profile that can be perfect fixed in your personal requirements. The job offer cover all the needs that you need and make the companies making and easier selections of their recluctans. Pros: Mighty Recruiter is a good tool for an independent or contract recruiter. It is easy to get started and have your job posted to several places at once and provides a streamlined method to track your candidates. Cons: I would like a premium tier of Mighty Recruiter that included more Applicant Tracking System features that allowed me to maintain a broader pipeline of talent. Pros: I am a Mighty Recruiter customer and received an Amazon gift card for completing this review. The website is easy to navigate, posts to dozen of job board, and provides a lot of quality candidates with its screening questions. Cons: I do not like the pickiness of the titles. I also do not like that there is no option to only see your ads, but it is still a good price for what it does. Thank you for your review, Bianca! We're glad you've had a good experience so far. Overall: Mighty Recruiter has been a very good website for our small business. In the past, it was very difficult for us to hire management, but now we have a great tool we can use. There are a couple of things I wish were a bit better, like the search function, but for the value that mighty recruiter gives, I can't complain. Thanks for the review Teresa! Pros: The best review community. The best support and very fast rewards. You can easily see the reviews or write your own one. The best! "I am a MightyRecruiter customer and received an Amazon gift card for completing this review." Cons: I dont like the website. Its a bit old and fancy. And sometimes it gets very slow and its hard to search things there. Pros: Can review for software products to help the community to know about better alternatives Guidelines were there on the landing page. What has to be done was clear from the beginning, no hidden intent. Cons: Had to use a title provided from them, this would have been better if we were allowed to come up with something creative from our end. Pros: Extremely easy to use. I was able to sign up in a few minutes and was surprised to see my job posting was already everywhere! 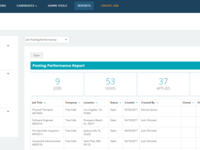 Pros: It has inbuilt templates for interview screening.It automatically post jobs on 29 + portals .It has well designed career pages.We can view Candidate status, rating .We can pre-screen candidates and review. Pros: MightyRecruiter provides great content for employers as well as webinars which are great even if your schedule allows you to only attend part of the session. It allows you to keep learning and growing as an employer, recruiter and professional. MightyRecruiter provides great content for employers as well as webinars which are great even if your schedule allows you to only attend part of the session. It allows you to keep learning and growing as an employer, recruiter and professional. Cons: Still a growing brand that isn't as well recognized as other platforms. May not get as much exposure through them currently but I'm sure that will change. Pros: Before actually trying it, appears that most of the services are free and that it will be easy to post a job and set up an account. Cons: Very long drawn out process to sign up, get confirmation, re-confirm, then post a job. Finally, it's posted and now there's no way to view the candidates until you call their Phone number. Then after 30 minutes when no one answers, push option for them to call you back. But they don't. Using chat, it says you need to call the number, so the chat agent can't help, and also the "call back" feature doesn't work. Took 2 seconds for the chat bot to delete the account though. Was going to propose my team utilize this tool, however, now I wouldn't recommend it. I have been using it for couple of months a great portal to depend on!! Comments: I am new to the recruiting field, and Mighty Recruiter was simple and easy to use...at an affordable price. We have received a substantial number of applicants from our Mighty Recruiter postings and will continue to post jobs on this site. Thanks for your review, Paula! Comments: "I am a MightyRecruiter customer and received an Amazon gift card for completing this review." It did not affect the quality of my review in any way. Pros: It is very easy to sign up and start using. It has everything I need in one place. I do not have to seek for resumes and post our ad somewhere else, with MightyRecruiter I operate different job board, review resumes, communicate with candidates - everything in one place. Cons: Can not think about anything specific regarding cons of the service, as I said it is a great platform and works perfectly for me so far. Overall: I've used others in the past and they are all pretty much the same. They all post your jobs on the same free job boards and then it's just pot luck. You get a lot of unqualified candidates and eventually you find a good one - hopefully. The difference I've seen with mighty recruiter is that I have a good relationship by email with their customer service department and they are responsive to problems and do try to help improve traffic to your job. Right now - posted two jobs and have only filled one. Really great ATS. Powerful features. And its FREE. Pros: I've been searching for an inexpensive Applicant Tracking System for a long time, with certain much needed features. My search is over. Not only is this app free, is has pretty all the same essential features that other apps are lacking or charge premiums for. This is a really fantastic fully featured ATS and am so glad I found tgis after trialing a dozen+ others! Love it. Cons: The one thing I dont particularly care for is the fact that the hosted widget does not give the same appearance as the actual career page. Overall: Makes recruiting, hiring, and keeping track of applicants a breeze. Thanks for being part of our team! We completely understand what you mean by wanting the widget to show completely. You could try adding a button to your website which leads to the MightyRecruiter Career Site URL which would do the trick, just have your site developer install the correct button! Pros: Ease of use, clear, concise. 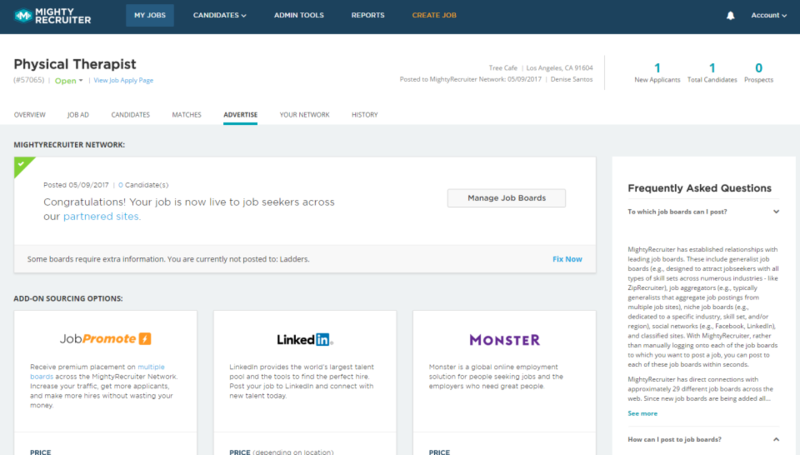 Overall: Compared with other boards that I have used, the functionality of MightyRecruiter is the best. Also, great marketing tools and informative emails! Hoping to find qualified candidates and plan on continuing another month to determine if this service is worth continuing. Thanks for your review, Susan! Pros: Mighty Recruiter is a great software for recruiter and job seekers. Its really help to find right job for right candidate. Cons: I feel the UI should be more interactive and resumes are limited for niche skills. Pros: Mighty Recruiter is a software that helps you with the whole process of searching, evaluate and recruit human talent for your company. What i like the most is that it can integrate international job finders like LinkedIn with the most common job finders in my country. Cons: It can be a little consfusing while you get used to the interface. Overall: I use Migthy Recruiter in my conctact center where frequently i have to search for new human talent. MR has made recruiting VERY simple and successful. Comments: We have had no trouble finding qualified applicants since we began using MR. Not only are the applicants of better quality, there are more of them. Our positions are all home-based, so MR was obviously the best choice as far as national exposure and distribution of our postings across various job boards. I would absolutely recommend Might Recruiter. Thanks for the review, Ted! Pros: My favorite aspect of MightyRecruiters is the qualification questions. They are very helpful and allowed us to find better candidates for our position. I am a MightyRecruiter customer and received an Amazon gift card for completing this review. Cons: Was a little tricky editing job posts in the beginning but after some practice was able to get the hang of it. Would love to see an initial tutorial for first time users! Pros: Mighty recruiter is a great tool that quickly gives you great leads. 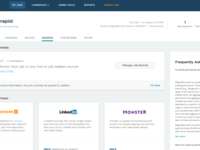 It can automatically post job postings in dozens of job portals. It's very easy to understand and control. Cons: Not really a con, but it's important to be very detailed with your job postings in order to get great leads. Won't be hard to remember, because their customer support is constantly telling you to do so. Thanks for an honest review! First Time Using Job Site! Comments: We didn't know which route to go. We are a expanding business, and the hiring process began to take too long a long with producing low quality candidates. We just started using MightyRecruiter, and have seen many qualified candidates! Would recommend to any business struggling to find quality employees. Thanks for your review, David! Pros: interview screening questions opportunity. Easy, user friendly navigation is great. Cons: lack of candidate response; in the location section, no flexibility for multiple or different locations. Overall: For a paid job posting service I have found the results or response poor to mediocre at best compared to similar paid sites. Recommendations to other buyers: It would be great to have flexibility to identify job location - or locations. Sometime we have a similar position in multiple locations. This is one of the best Website. I would truly recommend it to someone else. Comments: I have gotten different Applicants, but some times they don't come true with all the instructions that I give them in order for me to interview them. I am still interested on finding good candidates for my Agency. Josh from Mighty Recruiter is trying to help on getting better Applicants. Thanks for your review, Maria! Comments: The pros and cons of this platform are equal so it better to give it a try. Pros: Cost is reasonable, job aggregation seems competitive and access to outside job boards is also a good feature. Cons: Hard to tell where job(s) are actually posted and seen by candidates. Did not have any luck identifying qualified candidates. Pros: Mighty Recruiter was easy to use and very fast to set up. The customer service team was really helpful when I needed some account information. Cons: In looking for a candidate for a contract position, I got a lot of response from agencies applying on behalf of their clients vs. direct content with freelancers. I'd like to be able to filter that out if possible. Pros: I am a MightyRecruiter customer and received an Amazon gift card for completing this review.Being a recruiter, you should know it isn't easy to find an ATS and job aggregator that's worth money. MIghty Recruiter is free, but if I had to pay for it - I would. It's that good. Thank you for the review, Remya! Comments: We received many responses via the email. Some candidates have good background. Comparing to other online tools, it delivers a good value. Thanks for your review, James! Pros: Love the way they try to maintain their customers, vendors and employees all content with constant promos & more. Cons: Not very sure if the company has people doing customer service since I tried calling but no one picks up.